Stashing profits offshore may soon get tougher for companies, thanks to an ambitious plan released Friday by the finance chiefs of the United States, Canada and other leading world economies that want multinationals to pay more taxes. "National tax laws have not kept pace with the globalization of corporations and the digital economy, leaving gaps that can be exploited by multinational corporations to artificially reduce their taxes," the Organization for Economic Co-operation and Development said in a statement Friday announcing the new tax plan. It was unveiled at a meeting of the Group of 20 finance ministers and central bankers in Moscow, including Canada's Jim Flaherty and Bank of Canada governor Stephen Poloz. The Paris-based OECD says that the new 15-point plan includes ways to close loopholes and allow countries to tax profits held in offshore subsidiaries. If it is adopted, the plan would be implemented over the next two years and target such practices as deducting the same expense more than once, in more than one country. "It is clear multinational companies have developed an unprecedented know-how for minimizing their worldwide tax pressure," French Finance Minister Pierre Moscovici said in Moscow. "Some big companies manage to have a three or four per cent tax rate on their income worldwide," he added. The proposal aims to develop rules preventing companies from escaping taxes by putting patent rights into shell companies, taking interest deductions in one country without reporting taxable profit in another and forcing them to disclose to regulators where they report their income around the world. "It’s a matter of justice and fairness that multinational companies pay their fair contribution" to national budgets, German Finance Minister Wolfgang Schaeuble told reporters ahead of the G20 meeting. Since November, Britain has zeroed in on companies such as Google, Amazon and Starbucks Corp., calling their CEOs into parliamentary hearings to account for their tax avoidance schemes. California-based Google has avoided as much as $2 billion US in worldwide income taxes annually by attributing profits to a subsidiary in Bermuda that holds the rights to its intellectual property for sales outside the U.S. In May, the U.S. Senate held a hearing on Apple’s offshore tax strategies, including the company’s multiple units in low-tax haven Ireland. While Britain, France and Germany are strongly behind the plan, countries such as the Netherlands, Ireland and Luxembourg may work against it as they have benefited from setting up as low-tax havens. 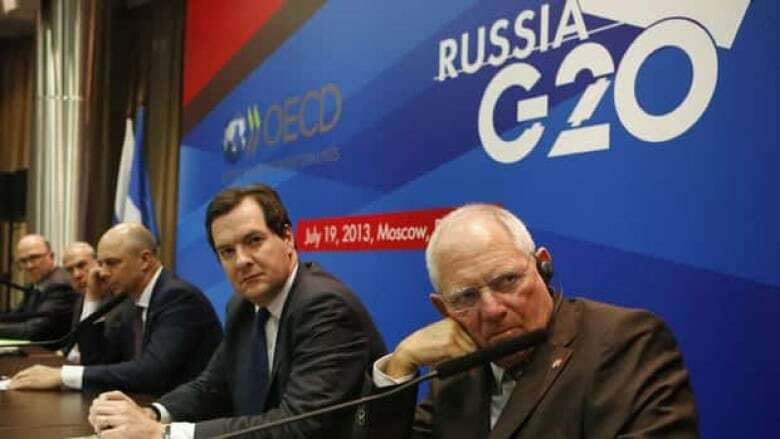 A coalition of development agencies, including Oxfam and Christian Aid, is urging the G20 to include developing countries in any regulatory scheme it approves, as emerging nations are particularly affected by tax abuses. They are also calling for regulations that would force companies to disclose profits worldwide, so that the public can see where money is being parked. The plan's designers insist it isn't anti-business and is in part aimed at making things more consistent for multinational companies and governments. Russian Finance Minister Anton Siluanov, the host of Friday's G20 meetings, said it's aimed at allowing "multinational corporations to prosper without loading a higher tax burden on domestic companies and individual taxpayers." The OECD has been at the forefront of efforts to tackle tax evasion, especially since the global financial meltdown five years ago. But repeated pledges at G20 meetings have not always lived up to their promise, and companies around the world continue to turn regularly to tax havens. Also at the Moscow meeting, the European Union's economic commissioner, Olli Rehn, sought to dispel concerns about Europe dragging down the global economy, saying that things are starting to look up. "We enter the second half of 2013 against a backdrop of stabilizing economic activity and improving confidence," he said, predicting a return to growth in the second half of the year.